Do you make these mistakes when brushing your teeth? You really wouldn’t think there is all that much to brushing your teeth, and that there certainly wouldn’t be anything that you could mess up! After all, almost all of us have been brushing our teeth since we got our first set of baby teeth, and almost all of us have been brushing at least once a day. To think that millions and millions of people all over the world are getting it wrong when it comes to brushing their teeth seems a little bit crazy – but it’s the cold hard truth! In fact, according to be American Dental Association, anywhere between 100 million and 150 million people in the United States alone are likely brushing their teeth the wrong way. Can you believe it?! On top of events, brushing your teeth incorrectly can lead to all kinds of dental health issues. And now we understand that our dental health is closely linked to the rest of our body, and if our mouths aren’t healthy, it’s likely that we aren’t, either. If you are ready to figure out whether or not you’ve been making mistakes when it comes time to brush your teeth you’ll want to check out the inside information we have for you below! Millions of people aren’t brushing every day! I know, I know – brushing your teeth should only take two or three minutes at the most, before some reason there are millions of people in the United States (and probably billions all over the world) that simply aren’t taking the time out of their day to brush their teeth every single day. If you can think of something funkier than that, I’d love to hear about it! Not only should you be brushing your teeth every single day, but you should also be brushing your teeth at least twice a day – and three times if you can squeeze a scrubbing in right around lunch. Your smile will thank you, and so will your dentist! Even though there have been commercials in the last few years telling people that they need to brush their teeth immediately after eating to keep them healthy, nothing could be further from the truth. You see, after you eat microscopic components of the food you have eaten still cling to the outer surface of your teeth, and if you start to scrub while those components are still there you’re going to do some serious damage. Those components are pretty abrasive, and if you combine those components with an acidic beverage – like orange juice, for example – you can really wreak some havoc. 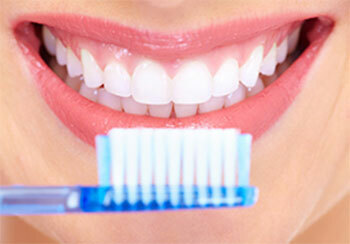 Try and wait at least 30 minutes after eating before you even think about brushing your teeth. Anyone that has spent a serious amount of time trying to get their lawn to look just as picture-perfect as any ballpark in America understands that you simply cannot cut your grass the exact same way in the exact same direction every time out. The grass just won’t support that kind of abuse. Instead, you’re supposed to reverse the patterns that you cut into your lawn every other time out, giving your grass the opportunity to recuperate and recover from the damage done to them previously. Your teeth operate in much the same way. If you’re brushing from the exact same spot every single time you’re going to end up “wearing a pattern” into your teeth, and worse than that you’re likely getting tired – and maybe even a little bit bored – towards the end of your brushing session. This means that the teeth that get cleaned last in line are going to get cleaned least – and that’s trouble! Try to change things up by starting to brush in the top right corner of your mouth, then maybe the top left, and then alternating the bottom spots before working your way back to the top right position again. You’ll buy yourself a bit of time, avoid doing any damage to your teeth, and will give your smile and upgrade at the same time. Though the overwhelming majority of people out there understand that you should be trying to brush your teeth for at least two minutes straight, a lot of people put off brushing their teeth until it’s the last thing that they do to get ready for their day – and by that point in time, the odds are even better that they aren’t going to be brushing their teeth for two minutes. If you need to, feel comfortable brushing your teeth while you shower so that you have more than enough time to get the job done right. Take the time and you’ll guarantee staying out of the dentist you probably won’t have to visit the dentist quite as often as you would have otherwise.